I’m watching my son play baseball. That means on this particular afternoon, I am sitting alone along the backstop in my relatively comfortable camp chair. Today I am alone, though that’s not the norm. The grandparents didn’t make this game, and my wife is at home with my daughter. As thrilling as the game is for my son, and of course for me, it’s less than riveting for my daughter — especially on a school night. With homework. Indeed, I’m worried about my son being out till 7 on a school night. But, it is what it is, and we will see. Anywho, as I’ve said before, I’m not necessarily the chattiest mom on the field and so I sit by myself. The other parents are lovely, to be sure, this is just my thing to deal with. As I sit by myself — riveted on my son when he’s in play (so to speak) — I can’t help but let my mind wander. Head over to Huffington Post to read the rest, won’t you? 1. What do y’all think? 2. Is it a dumb idea? 3. Have any of you done a campaign? 4. Did it work? 5. Which company did you use? 7. Would any of you contribute if I did one? 8. If so, what reward might you like? I appreciate all feedback on this one. Thank you! It’s butch to give advice. Be Butch. Ohmygod, am I ever getting excited! Have you ever been to Dinah? Do you know what I’m talking about? Maybe you are a baby butch who just came out. Maybe you are an established butch who never thought Dinah was for you (because you don’t play golf). Maybe you live in a galaxy far, far away from Palm Springs. Whatever the reason, if you don’t know about The Club Skirts Dinah Shore Weekend (affectionately dubbed, “Dinah“), you need to come! Let me elaborate. This is a huge party in the desert. It’s more than a weekend (for those of you who can take a few days off), and it is filled with lesbians, pool parties (read: Bikinis), comedy, hot DJs, go-go dancers (who flirt with you), booze, celelesbians (celebrity lesbians), a film festival, and, I’m told, lots of hooking up. Honestly, that’s not my style, but I understand if it is your style, opportunities abound. Palm Springs is gorgeous. There is all kinds of fun stuff to do, see, play, and listen to. But there is nothing better for the soul than to be surrounded – literally – by other lesbians. And there are a fair share of butches there, too. It probably should be a saying that “where there are bikinis, there will be butches.” You know us. We are sporting the rad board shorts, paired with either a ribbed tank, surf shirt, or some sort of yoga top. There are even those of us that brave a bikini top with our swim trunks. I am not one of those butches. Forgetting for a moment that it’s a tiny bikini, no one wants to see my stomach in public. We are the ones who go to the bar and bring back buckets of beer. The ones playing football, volleyball, or frisbee in the pool. The ones splashing the girls in bikinis. You know, on accident. Yeah, there are butches at Dinah. Femmes, too. And you know what else? I’ll be there again this year. And, I’m excited to say, I’m bringing my wife! I went last year and definitely had fun. You can read about that here. But it will be nothing compared to the fun of enjoying this with her! I literally cannot wait. I will do my share of running to the bar for drinks for her, will gladly carry her beach bag, and will probably splash her “accidentally” once or twice – like a pathetic teenager. So, I’m going. Are you? It’s butch to surround yourself with lesbians in bikinis. Be Butch. 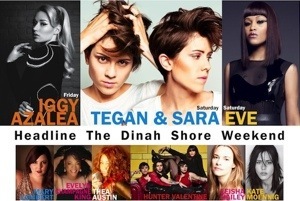 Turning this year again the city of Palm Springs into the ultimate entertainment hub, the 2014 Dinah Entertainment Roster delivers an epic slate of Top Ten Billboard headliners that make up one hell of a phenomenal line up – one of the greatest in The Dinah’s history. Also headlining the “Black Party” is female rap titan Eve. The Grammy-Award winning rapper will perform her slew of music anthems including “Satisfaction,” “Who’s That Girl”, “Gangsta Lovin’”, and “Let Me Blow Your Mind”. Also set to top the bill at the epic lesbian party is hip-hop’s biggest revelation Iggy Azalea who will take center stage at the iconic “White Party”, Friday, April 4 at the Palm Springs Convention Center. The Dinah 2014 will also be rocked with special performances from 2014 Grammy nominee Mary Lambert, the voice behind Macklemore & Ryan Lewis’ VMA award-winning pro-equality “Same Love”; Grammy Award-Winning R&B diva, Evelyn “Champagne” King known for her multi-million selling classic old-school smashes “Shame” and ”Love Come Down”; Thea Austin, the legendary voice of “Rhythm is a Dancer” by Snap! ; and power, pop/punk band and stars of “The Real L Word” Season 3, Hunter Valentine, to name a few. Also coming back is The Dinah Film Festival presented by OML, held on Friday, April 4, at 8:00 p.m at the Hilton Hotel. Produced by award-winning filmmaker JD DiSalvatore (the producer of Shelter, Marine Story and Elena undone, to name a few), the Dinah film Festival will showcase a variety of quality lesbian films including “Little Horribles” “Nikki & Nora”, “Kiss Her I’m Famous”, “Dyke Central”, and the short film “Secrets & Toys”, among others.